Most genies offer three. Where do they get them? The Harvester is an old woman, who wears a four-leafed clover in her locket and a garland of dandelions on her hair. The locket was a gift from a suitor, many years before, bought at the Crossroads Station bazaar. The dandelions have to be supplied fresh, daily. So, she keeps a greenhouse in the aft of her ship. The Harvester tells her genie customers that the wishes she harvests come from the overripe gold flowers gone to fluffy white seed. This, of course, is not true, but the genies love it. Occasionally, a particularly sneaky genie will “pocket” a sample of the dandelions, hoping to grow a harvest of his own. But, the Harvester altered the dandelion DNA long ago, and the flowers will only grow in a soil laced with her secret mix of protein supplements. 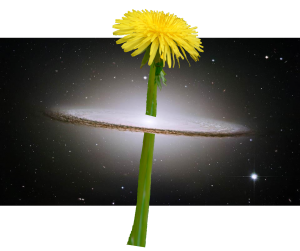 The most ingenious genie that the Harvester ever encountered tried to track down the original planetary source of dandelions. He reasoned it must be a magical world full of happiness, rainbows, and joy. Unfortunately, the founders of New Earth erased all traces of the original Earth’s location during a nasty legal battle with Earth IX. Neither planet won exclusive rights to “Paris” or “Rome;” New Earth won the rights to “New York.” The genie won nothing and skulked his way back to the Harvester to buy a year’s supply of wishes, packaged in bundles of three. So, where do the wishes come from? The Harvester disables her shipboard navigation systems every time she begins the trip. So, in the strictest sense, even she does not know. But she can find her way. At the bluish star, she taps the thrusters twice. When there’s the triangle of pinkish stars, she hangs a hard right. Then, right at the edge of the dust cloud, where the icy specks merely tickle the hull of her ship, the Harvester turns the hyper engines on full. She doesn’t watch the ship clock or count the seconds. When enough time has passed, the Harvester just knows, and she brings the ship to a full stop. Outside, the space is clear. Her path brings the Harvester to the nadir of an orbit perpendicular to the plane of asteroids orbiting her own, secret, deathly silent black hole. An extra second on the hyper drive and her ship would be too close, but the Harvester never gets it wrong. From her vantage point, the Harvester scans the rings of asteroids, but she almost always finds what she’s looking for by the naked eye. So, with her graying tresses mirrored, shadowy in the glass, the Harvester looks past her reflection and watches the asteroids through the ship windows. Together they circle the black hole, swirling toward it, until they disappear. Except for one. She’ll spot one, and, then, after watching long enough, she’ll spot another. Individual asteroids following their own, bizarre gravitational rules. Ignoring the pull of the black hole. The Harvester notes these aberrations down, and when she’s found enough of them… She harvests. Inside each aberrant asteroid, sometimes a canker on its surface and sometimes a heart in its very core, a geode of hypercrystals resides. The Harvester chips them off or cracks the asteroid wide, freeing the hidden crystals. The crystals, when she finds them, are coupled to complimentary geodes in complimentary asteroids orbiting entirely different gravitational wells in entirely different, alternate universes. The asteroids, while reigned by their geodes, follow these alternate gravity paths, creating their telltale, seemingly illogical orbits. Why so many there? Mixed into the field of asteroids around that black hole? The Harvester doesn’t know, but a hyperstar exploded there. Back when the black hole began. The Harvester breaks the geodes open, shattering the crystalline pattern, and decoupling the hypercrystals. They sparkle, each tiny crystal feeling and dallying with the pull of hypercrystals in alternate universes fanning across potentiality. The rest of the process is easy. A milli-mole of hypercrystal, soldered to a positronic picochip encased in a language processing micro-computer… The Harvester packages them in hand sewn pouches, made from Antarian arachnid silicon-silk. In threes, the wishes clack inside their pouches, each tiny computer housed in a pleasing, cheerfully colored aluminum shell. They look like marbles. The Harvester discovered her wish farm eons ago. She’d been harboring a genetic errant on her ship. His crime was old, and he’d hid from it so long, changing his mind and body so many times, that the Harvester felt he could no longer be held responsible. The azure-skinned, Buddha-bellied alien with the deep laugh who she knew was hardly the wispy green Aniliidaen who had eaten his own mother anymore. Most of his memories from that time had been erased by the constant genetic phasing, and she knew he would never dare commit any crime — other than running — again. Nonetheless, the errant and his booming laugh, after weeks in the asteroids, drove the Harvester nearly crazy. She stopped tending her shipboard garden, which came up all weeds in her neglect, and turned to the out of doors. Out of the ship. The Harvester floated, peaceful and serene, in her spacesuit. She kept herself tethered to the now loathsome ship and its unwanted tenant but otherwise bounded lightly from one hanging asteroid to another. As her suited hand brushed one of the rocky surfaces, a dome of brittle rock crumbled at her touch, revealing the sparkling hollow of crystals beneath. Thinking the crystals pretty, the Harvester chipped them out of their cranny in the asteroid, stored them in a pocket of her spacesuit, and brought them back with her. The rest is history. Or fable, according to the authorities at Crossroads Station, but everyone suspects the Harvester paid them to play it that way. While shining the crystals, buffing them with a sonic-razor, the Harvester noticed they looked awfully similar to the crystalline nodes in an elasti-particle wired compu-chip the errant was fiddling with. He’d been trying to upgrade her shipboard computers with worse than mixed success. The Harvester asked the errant if she could have one of the burned out boards and tried wiring one of her shiny new crystals into the place of the fizzled node. It was delicate, tricky work, and the errant, in his overbearing way, hovered over her. Heckling. “I wish you’d leave me alone,” she muttered and felt the strangest spark of electrical activity under her fingers. Then, even stranger, though the errant leaned closer and boomed at her about how she’d fried the crystal and needed to be more careful, the Harvester felt his presence back away, move across the room, and leave her alone. Exactly as she’d wished. It was a duality of moment, as if she were living in one universe and simultaneously hallucinating the reality of another. But then the duality faded. The intensity of the experience did not. When the Harvester finally got the next crystal wired, she was careful not to make any wishes. Unlike the others, the third crystal didn’t burn out, blackening with fine crack lines. No, it sparkled finely in the compu-chip, and the Harvester inserted it into the hardware of a palm computer. A smooth, egg-shaped device with voice recognition and the most powerful actuator chip she could find. That was the first fully manufactured wish. Over the years, the Harvester fiddled with the specs until she got them down from egg-sized to marble-sized, using the weakest actuator chip that could actually couple universes, producing results instead of mere hallucinations. She sold them, but she never tried one herself, except to test them. Those wishes were always simple — “I wish my wilted dandelion were fresh again” — nothing that mattered. And then her suitor returned. He told her he wanted to buy wishes, and the Harvester told him she didn’t deal with customers. Only genies. “Multiples of three,” she answered, thinking she should get back to her ship and out of the crowded Crossroads Station bazaar. Unconsciously, she fingered the four leaf clover pendant at her neck. He refrained from answering cheekily with something like, “You mean I’m still handsome?” But he could see her eyes measuring him. Liking what she saw. As she always had. “Besides, you haven’t committed any crimes to run away from,” she added, dropping the pendant suddenly. It fell back against her throat. “Let me out,” he said. But her suitor followed her through the bazaar. As she neared her ship, she was skipping, running through the crowd. Her dandelions fell out of her hair. But her suitor kept her in sight nonetheless. He gathered the fallen dandelions, one by one, into a droopy bouquet. He stood at the edge of her airlock, bouquet in hand. It could have been twenty years ago, when he had last pursued her. When she was newly the Harvester. A young Harvester. Seeing her suitor there, feeling that loopy sense of time folding back on itself, being reminded of her younger self… She couldn’t help but let him in. For old time’s sake. For the younger self that was gone, subsumed inside an older woman. No, she would give her suitor no wishes. Nor would she make wishes for him. The Harvester and the suitor sat together. They drank tea. They talked. It was quiet, and the Harvester didn’t feel she had recaptured her lost youth. Only looked at it from a new angle. “Give me another chance,” her suitor said. He put his hands out, old and worn. And the Harvester, with only a slight hesitation, took them. It was the same universe it had always been. But completely different. And the Harvester wouldn’t have had it any other way.